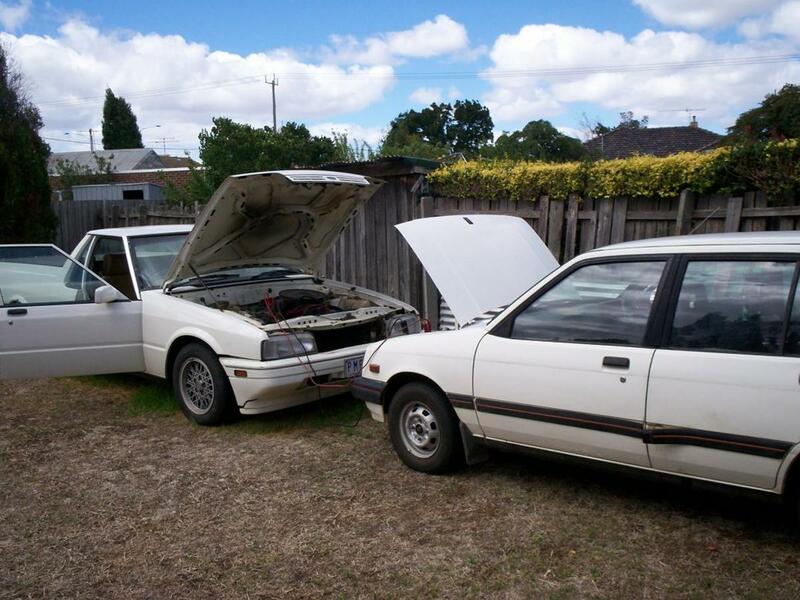 Hardlymoving repairs and flips Toyota Camrys and has written extensively about these dependable cars. 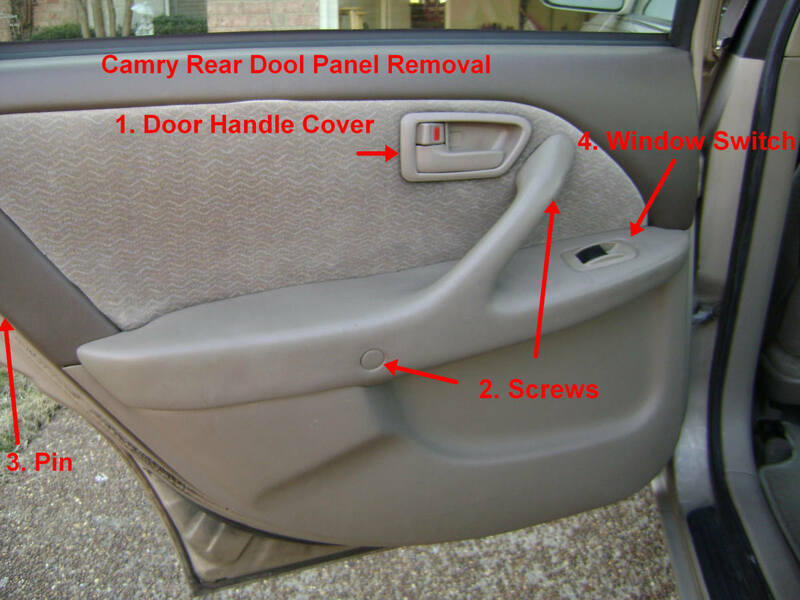 This do it yourself (DIY) article provides details on fixing or replacing the rear exterior door handle, door latch, or door lock actuator for the 4-door (1997-2001) Toyota Camry. 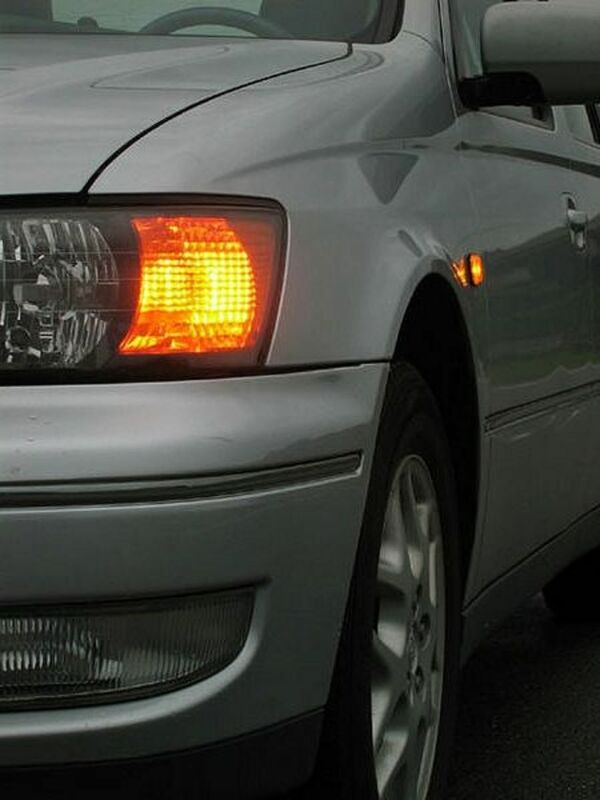 The repair principles here will also work on other Toyota vehicles. 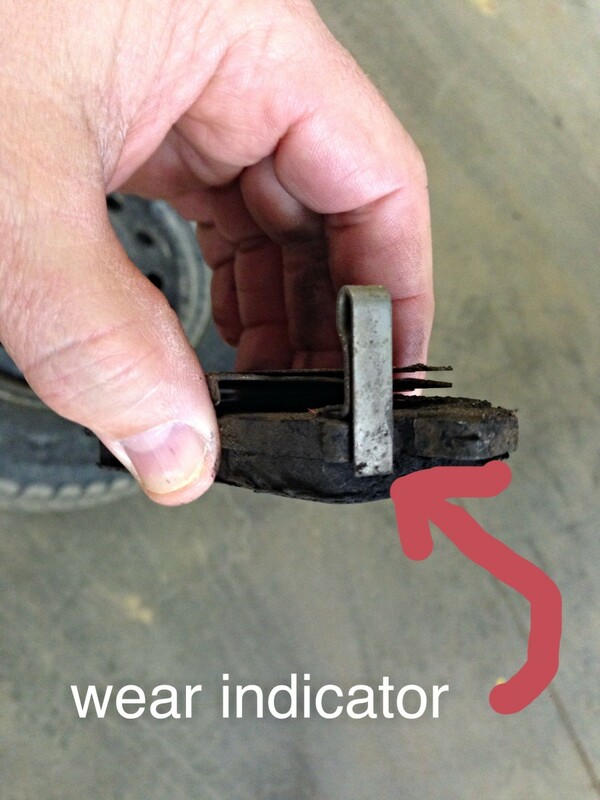 Why cover three repair items in one article? Sometimes, it's impossible to access and repair a damaged component without removing another component which may require repair as well. 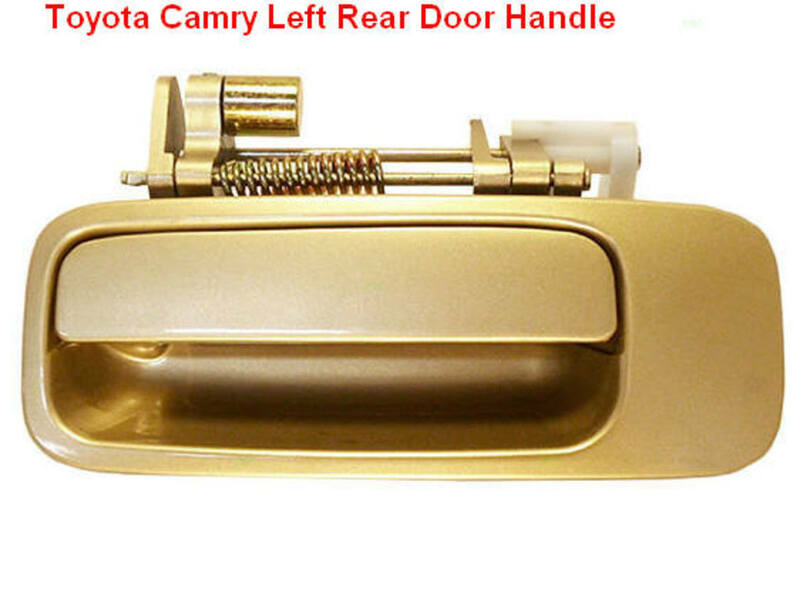 Specifically, you can't access the rear exterior door handle or door lock actuator without removing the door latch. 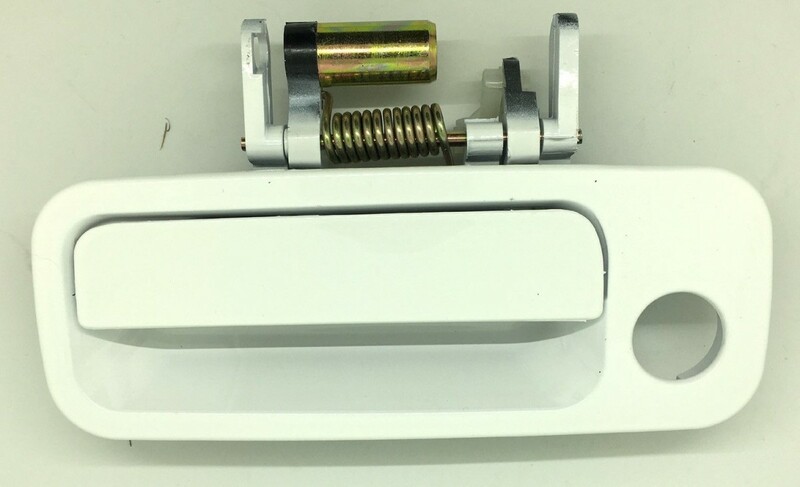 The door latch blocks access to the door handle's rear mounting bolt, and since the door lock actuator is mounted and braced to the door latch, you can't remove the actuator without removing the latch. The door handle is made of plastic, which ages. So especially in frigid conditions, the handle can unexpectedly break off. Attempting to fuse the handle at the point of breakage with epoxy glue will fix the problem temporarily. But even with epoxy, the handle will eventually break free. You can order replacement door handles, both painted and unpainted, from various vendors on the Internet for modest prices. My preference is to match the car's paint code with a pre-painted door handle. 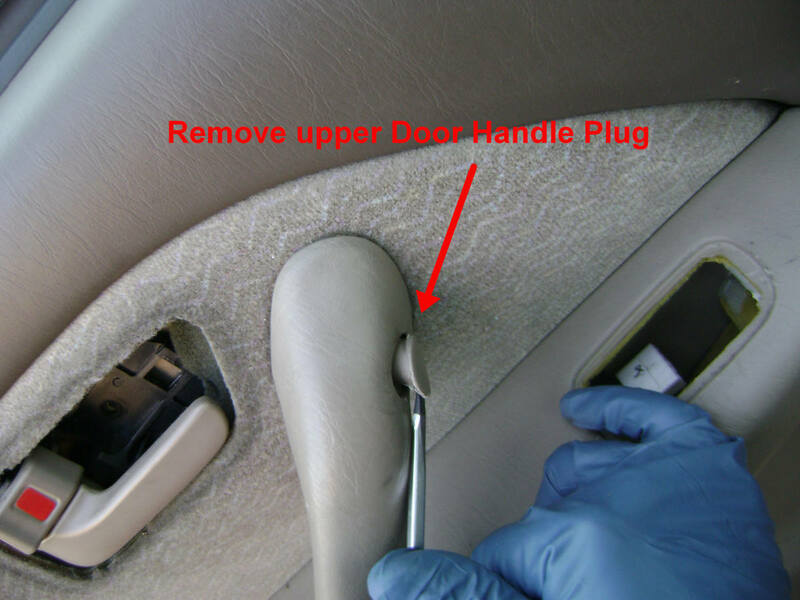 If you can't open the door by pulling on either the inside or the outside door handle, you will have to replace the latch. 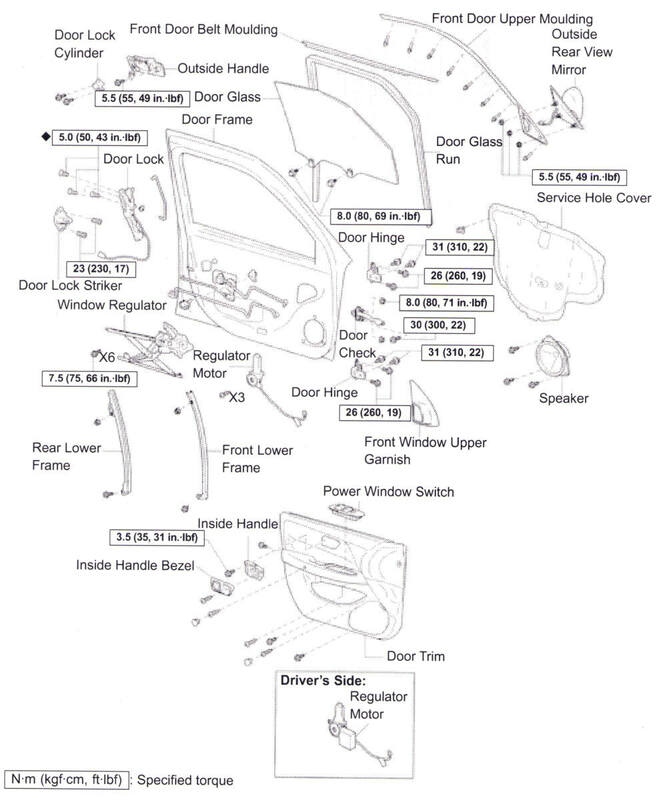 Unfortunately, the latch assembly is a very expensive replacement product ($200), and Toyota does not sell replacement components for the assembly. 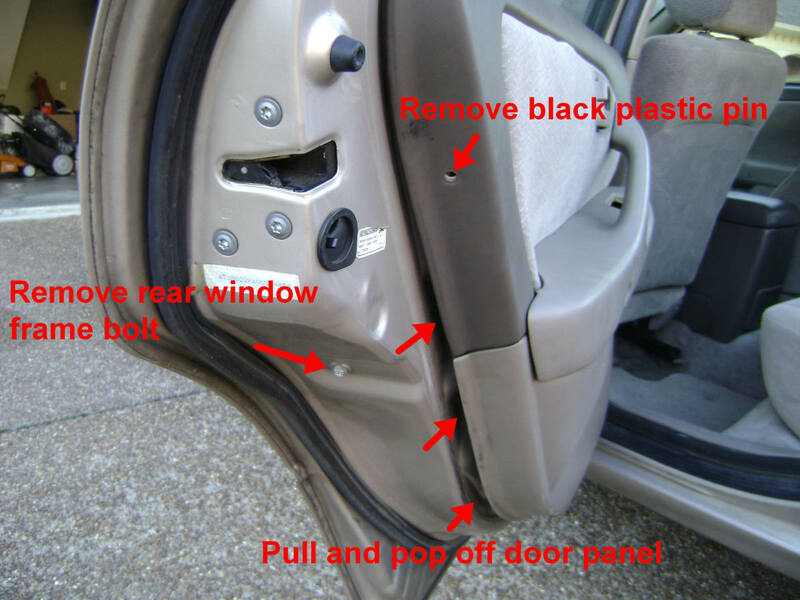 Obtaining a used replacement from an auto salvage yard is worth considering, but door-latch assemblies are usually missing from junk cars due to the high demand for them. 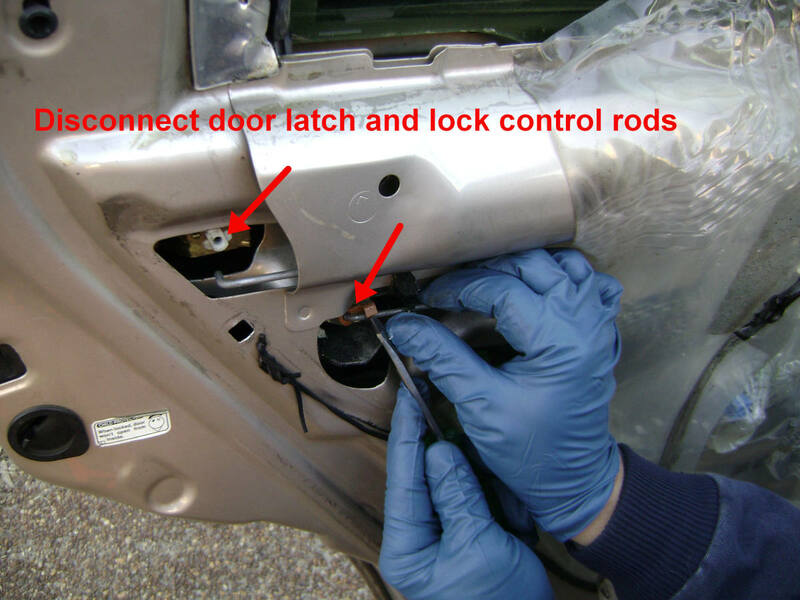 If one or more door locks will not lock electronically when you are using either the master door lock switch, ignition key, or remote door lock key fob, the door lock actuator motor has become weak or failed. 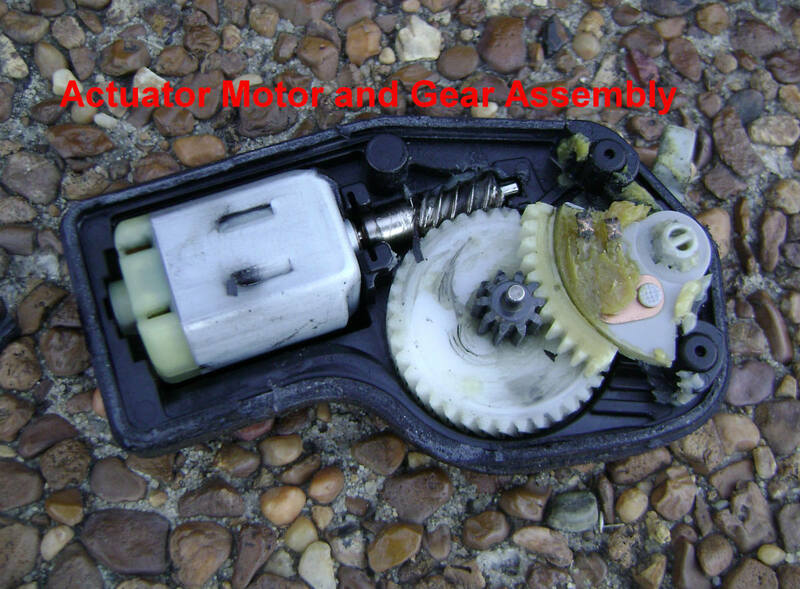 The actuator motor can be replaced, but is not available from dealers as a replacement part; they only have the complete door lock actuator assembly, for approximately $150. However, vendors on Amazon and eBay sell replacement motors for OEM (Original Equipment Manufacturer) providers of Toyota. 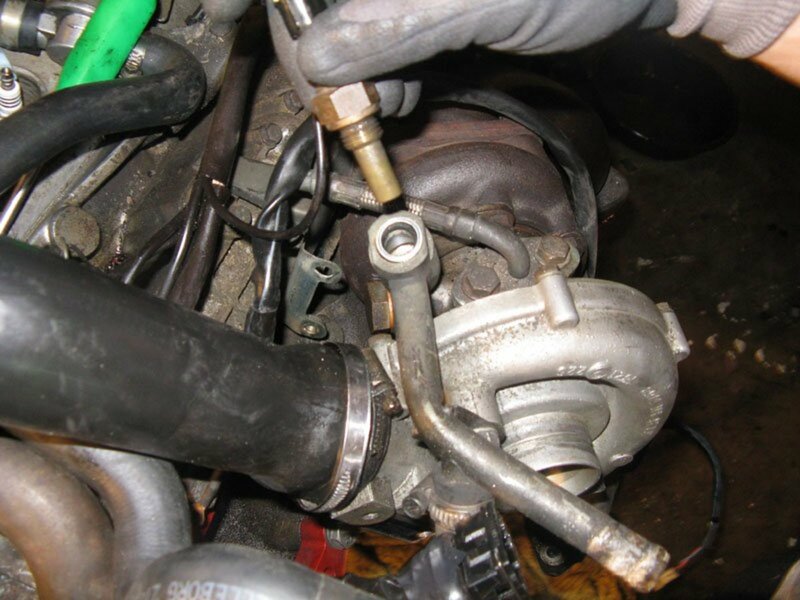 In addition, third-party parts vendors on the Internet provide complete actuators for considerably less than Toyota. 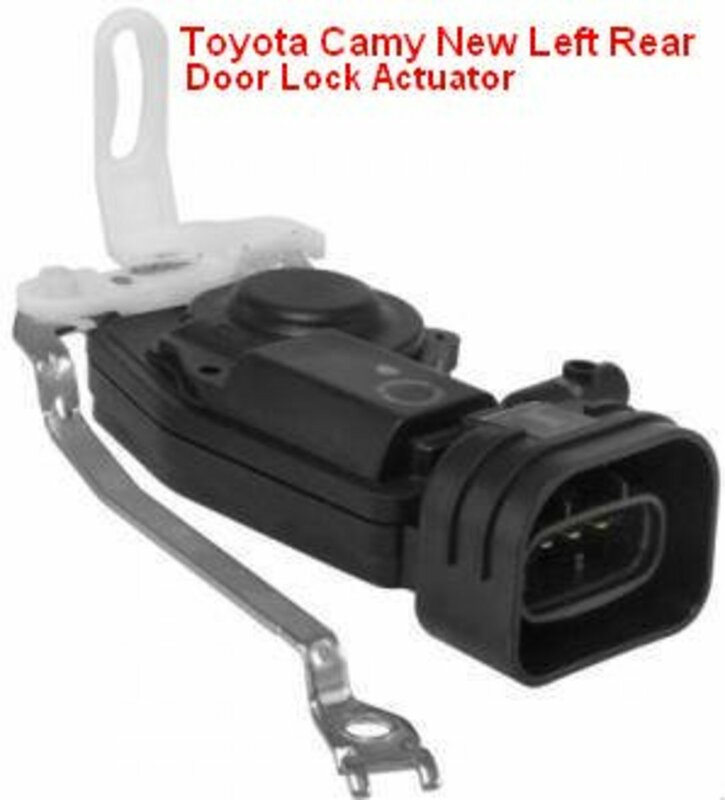 The Toyota door lock actuator assembly encapsulates the motor and the gears it drivers in two black plastic covers. These covers are lightly glued together, and (as the last section of this article shows you) can be easily separated by striking the contact seams with a wide-tip screwdriver and hammer. When the seam partially opens, the rest of the cover can be pried off which will break the glue's adhesion. Once you get the cover off, you can replace the motor with a new one. 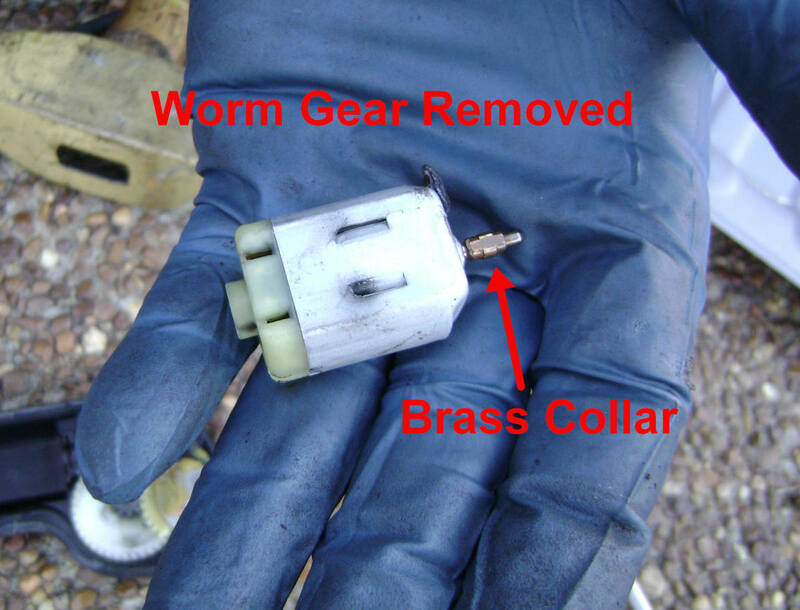 The Camry-type replacement motor must have a brass collar attached to the end of the motor's rod. A worm gear then slides over the collar. 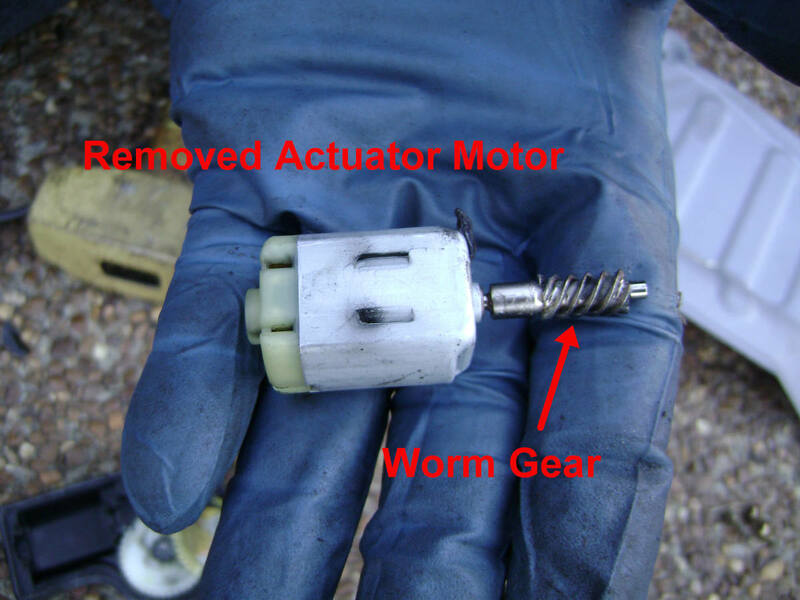 The worm gear, in turn, rotates the gears inside the actuator assembly. With no glitches, approximately 1.5 hours. 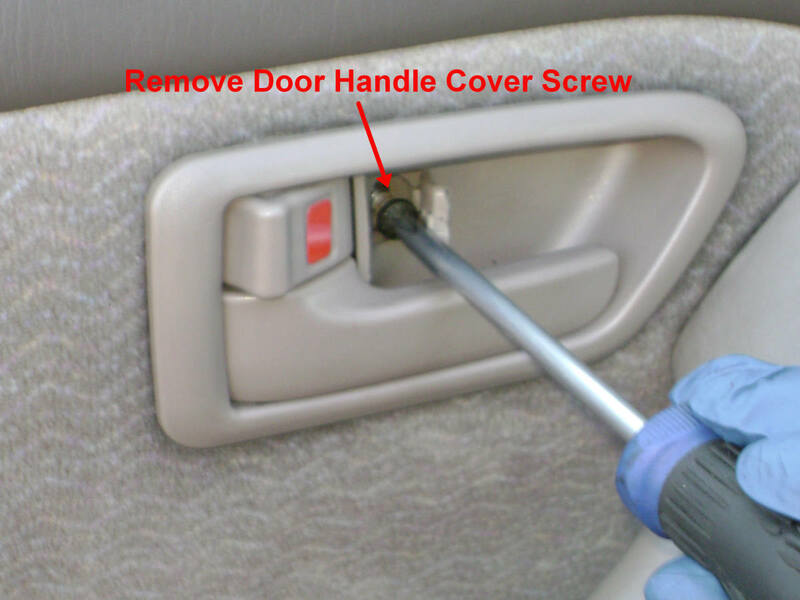 Pry off the interior door handle cover from the door handle and lock pivot pins. 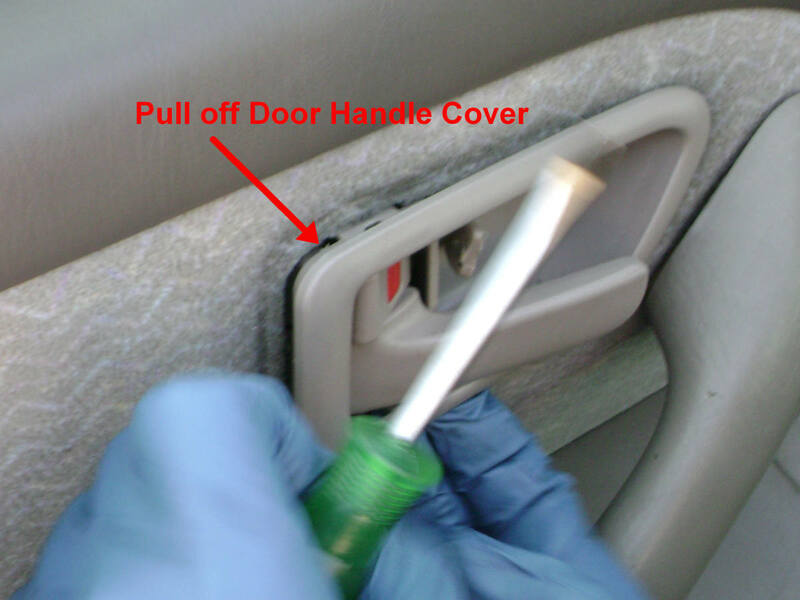 Pull off the interior door handle cover. 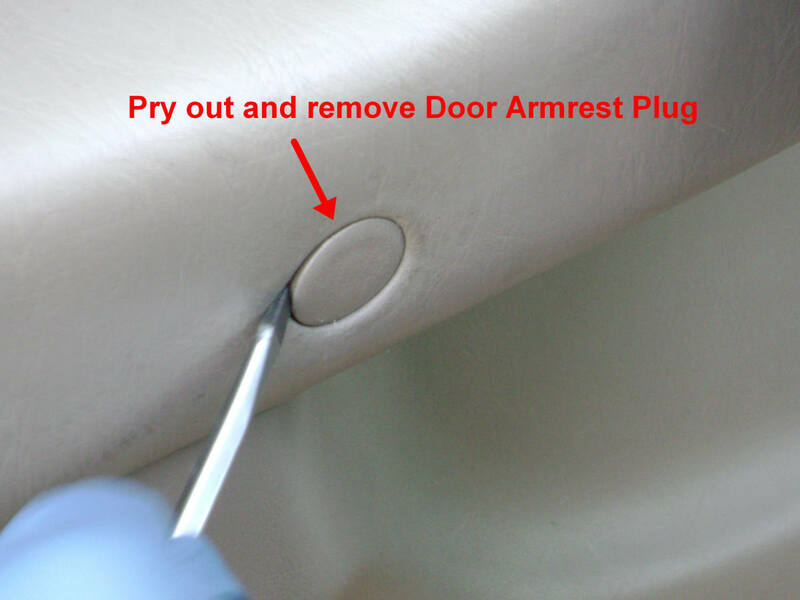 Pry out the rearmost Armrest Plug. With a long Phillips-head screwdriver, remove the screw. Pry out the front upper Armrest Plug. 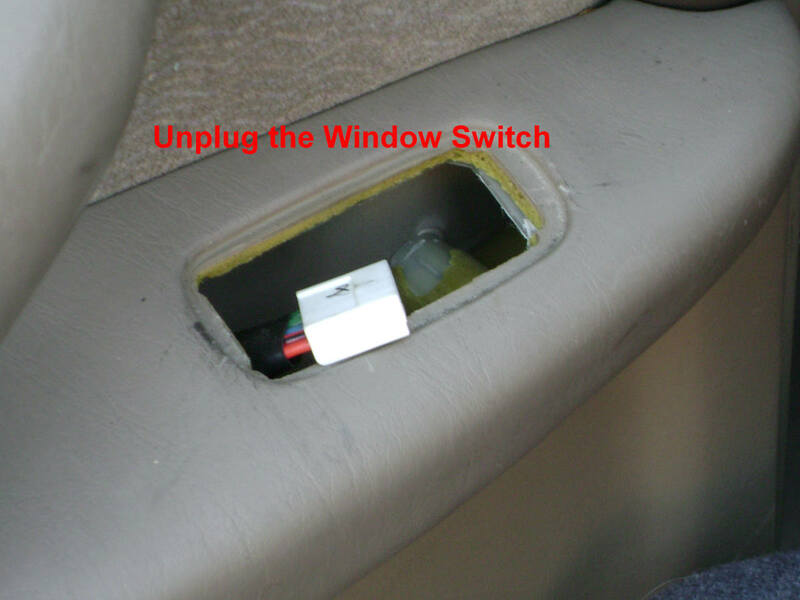 Using either a plastic mini pry bar or a screwdriver, pry out the front of the Window Switch. Pull the switch forward and up. Disconnect the electrical fitting on the switch. 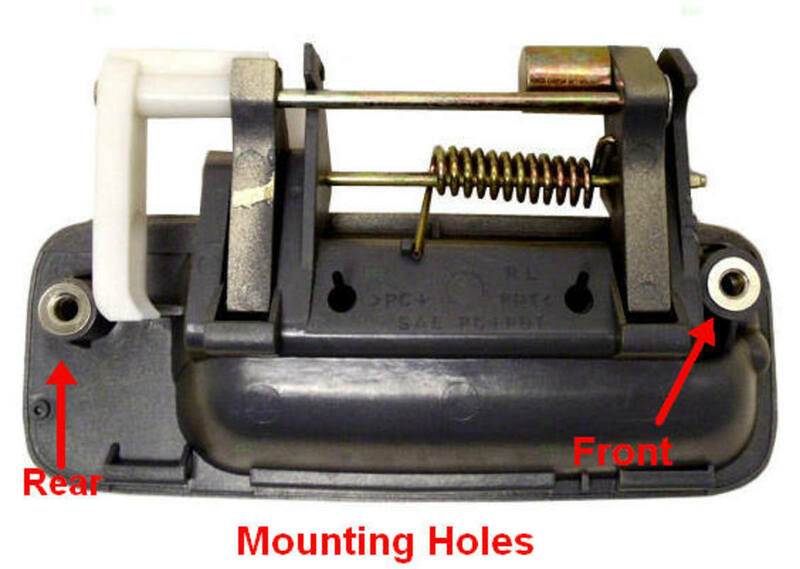 Position either a mini plastic pry bar or screwdriver under the cover plate and gently pry off the cover plate. The plate is fitted to the door with plastic push pins. If you pull on the plate too aggressively, the pins might break. 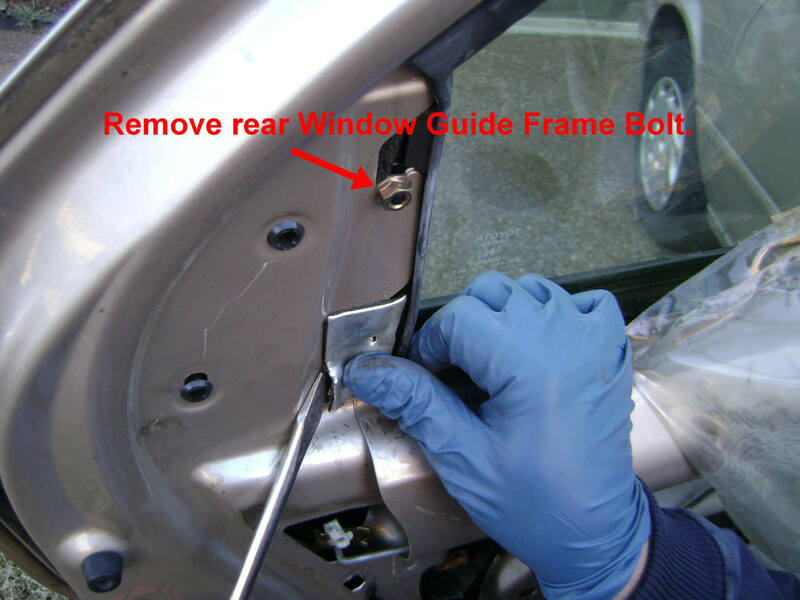 Remove the rear window frame (guide) rail bolt. 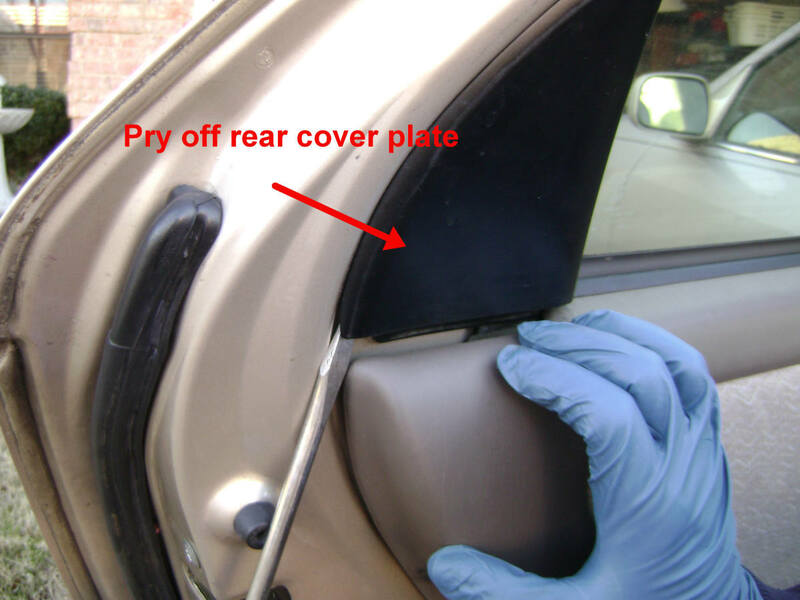 Remove the plastic push pin from the rear of the door panel. 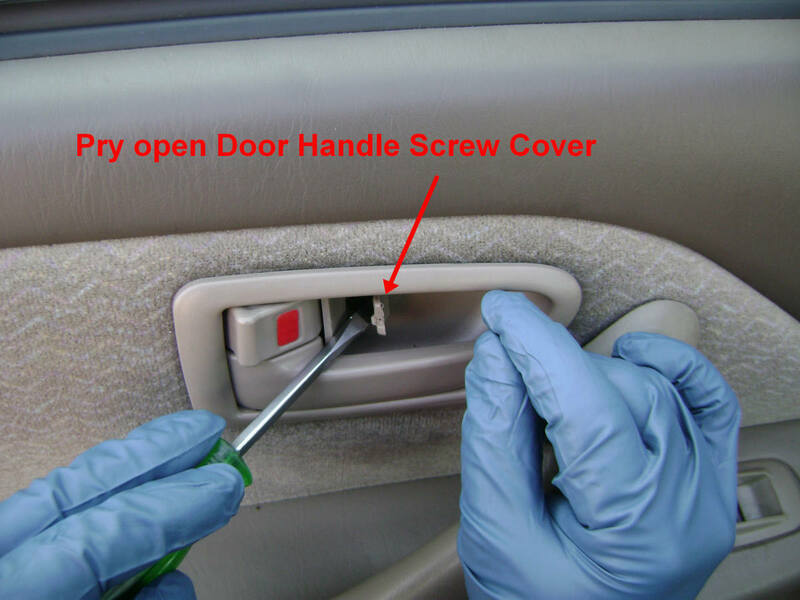 Using either a plastic pry bar or a wide-tip screwdriver wrapped in tape (to protect the paint), nudge the bar tip between the panel and the door. 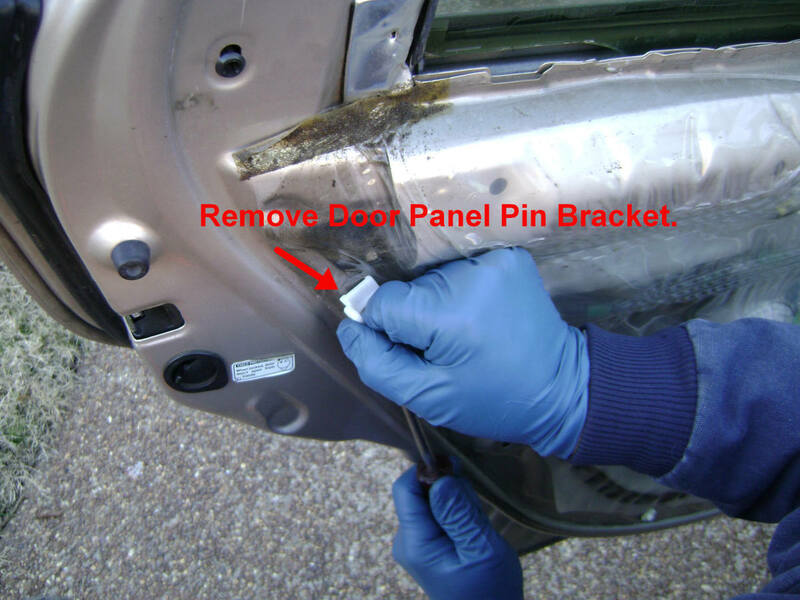 With some gentle prying action, the plastic fastener pins recessed in the door panel will pop off the door. Work around the door panel, pulling and separating the panel from the door. Pull the door panel up and away from the door. Remove the white panel pin bracket from the door. 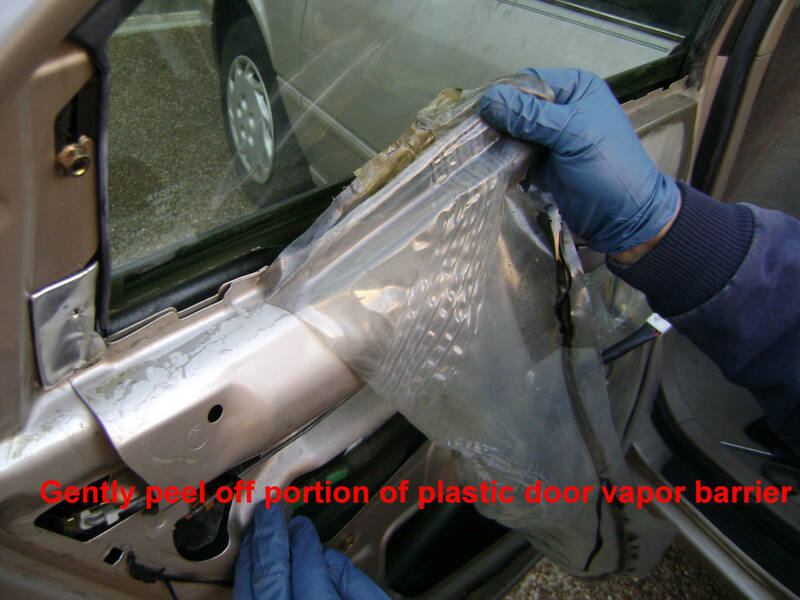 From the rear portion of the door, peel back halfway the clear plastic vapor barrier. 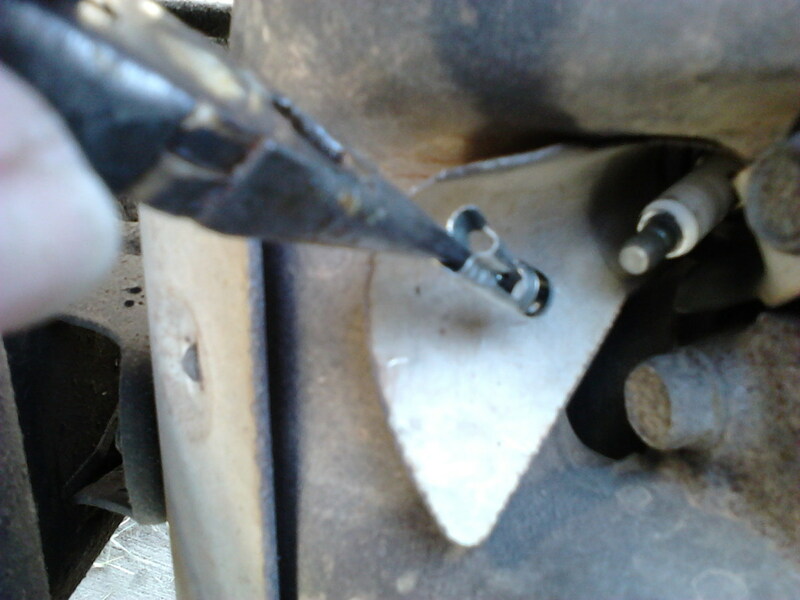 Using a thin-tipped screwdriver, hold the control rod with the right hand while applying upward pressure on the rod connection fittings until the plastic clears the rod. Pull the rods out of the plastic connection fittings. You need to remove this bolt to allow the guide rail to move when you pull out the door latch. 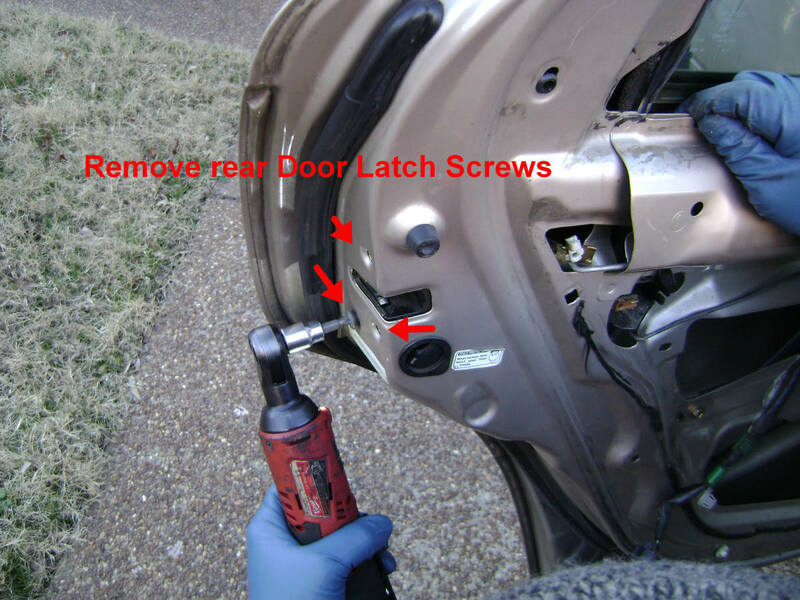 Use a Torx Socket to remove the Door Latch Screws. 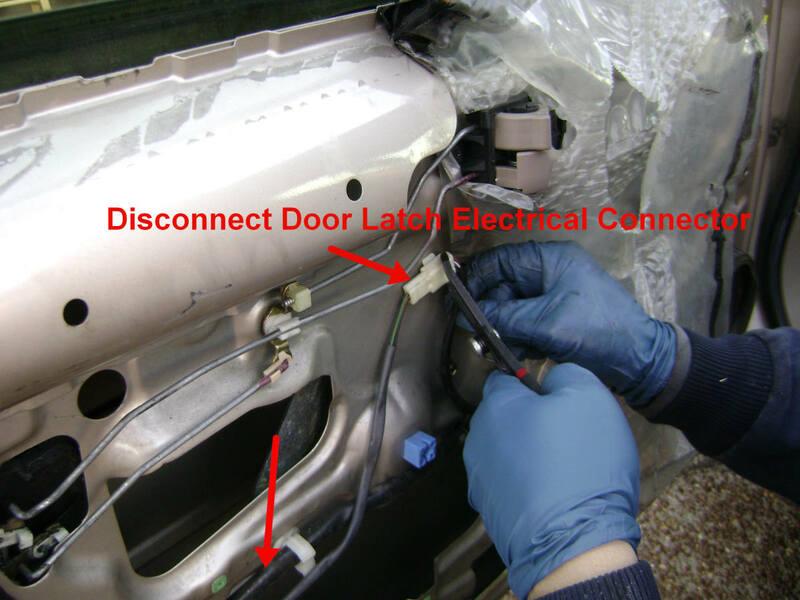 As shown below, disconnect and remove the two electrical fittings leading to the door latch. 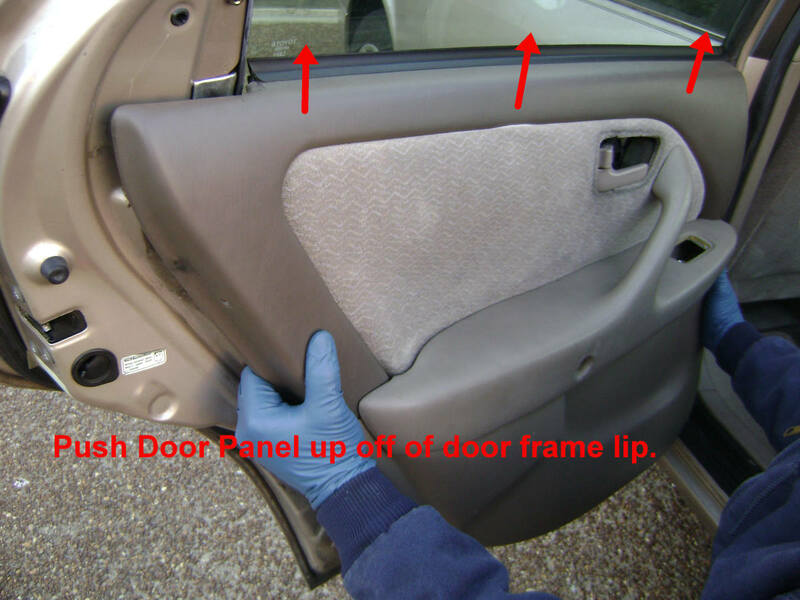 The rear window door frame is the only object left that obstructs the removal of the door latch. Since the window guide rail is unbolted, you can push the guide rail inwards while you pull the door latch out via the door access hole. 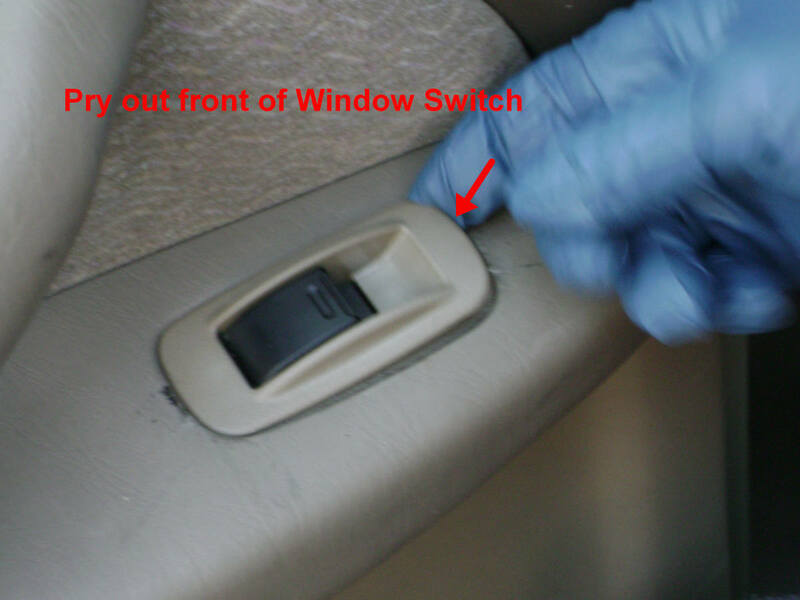 While pushing in on the window guide, and watching your progress through one of the access holes, position the door latch so that it clears the guide. 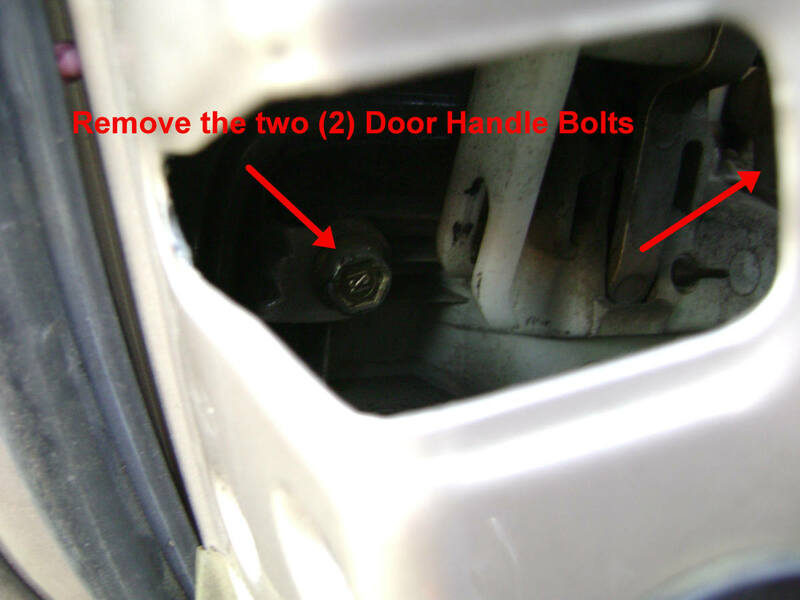 Either removing or unbolting the door latch will allow access to the rear door handle mounting Bolt. 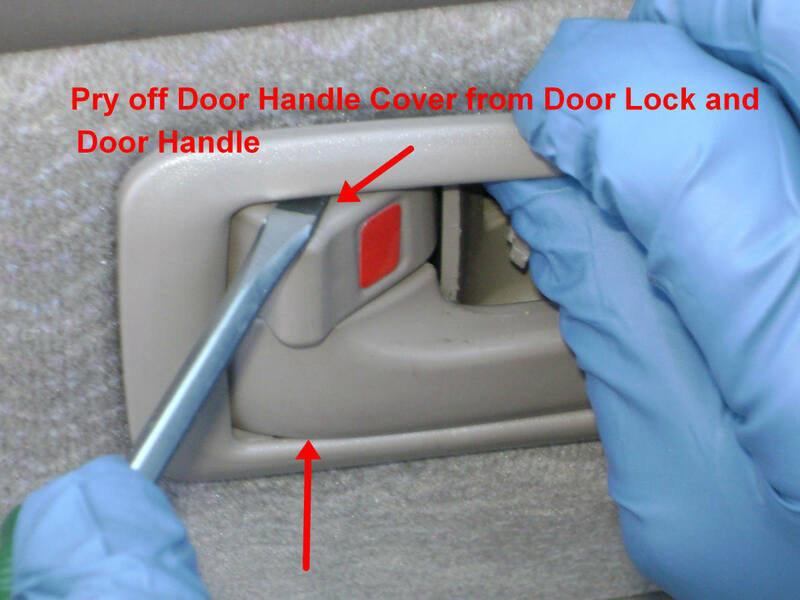 Pulling off the "Child Lock Switch" rubber cover provides one path. You can access the front bolt through one of the door's access holes. 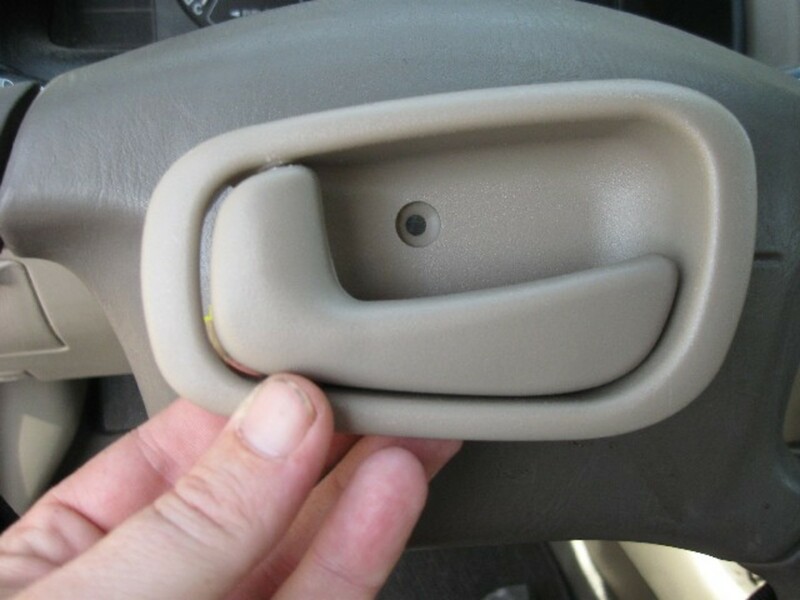 The interior of the old door handle has a lip that holds the handle to the door. 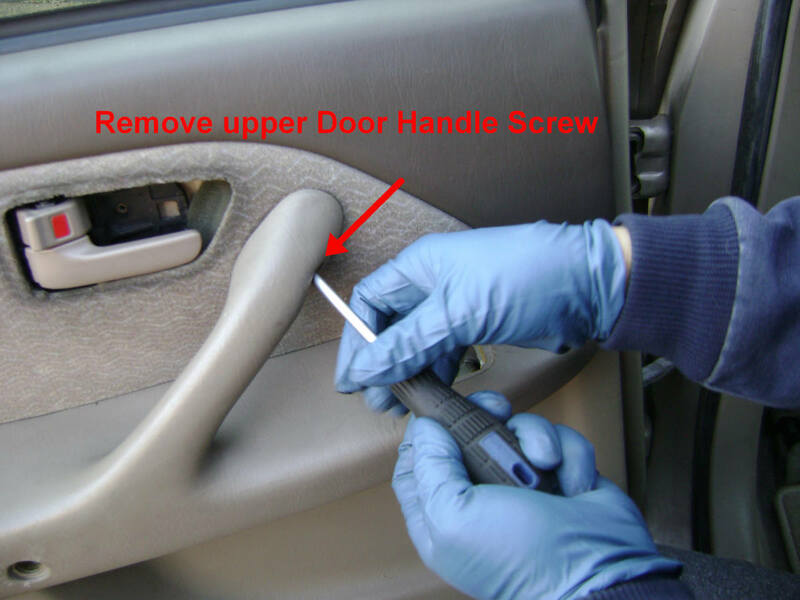 From the inside of the door, lift the lip over the door's mounting hole to remove the handle. 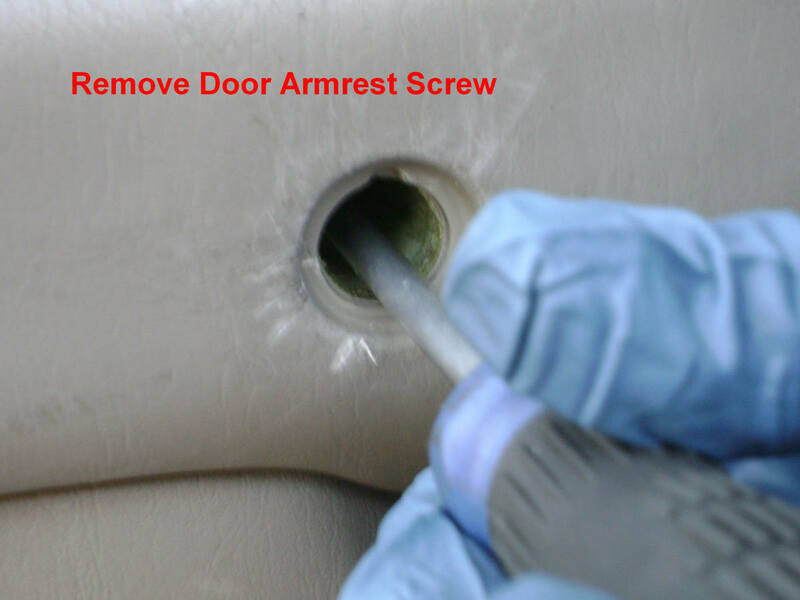 If this is difficult, from the exterior of the door handle, use a taped wide flat-head screwdriver to lift the handle above the door's mounting hole. 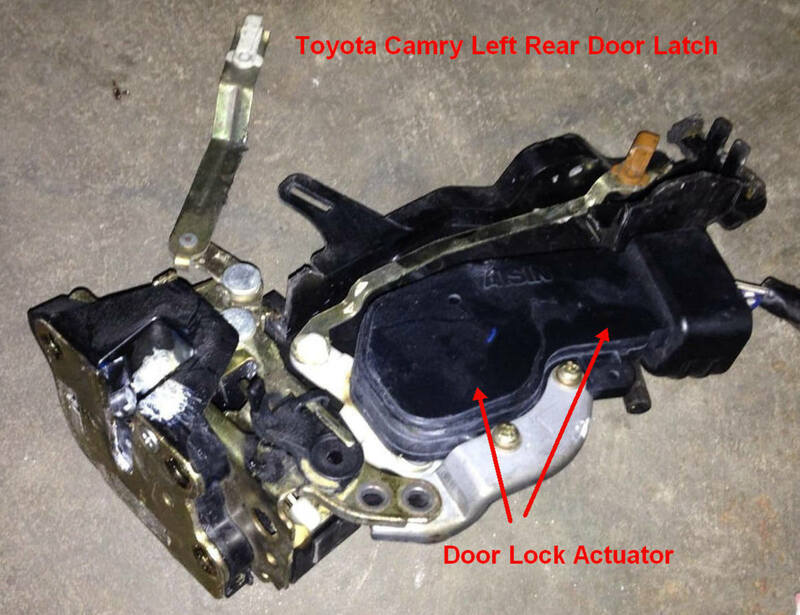 If you bought a new replacement door latch, it is probably missing the door lock actuator assembly. 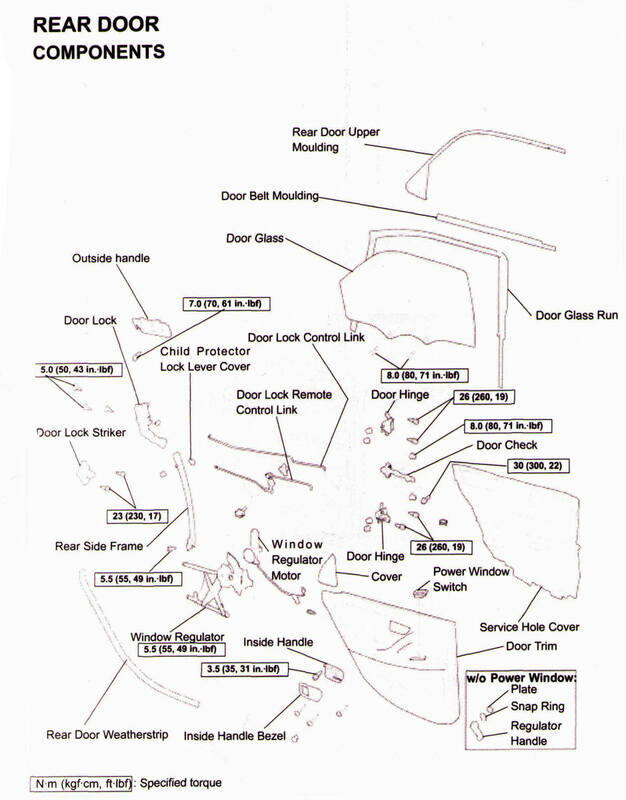 The lock actuator from the old door latch must be transferred to the new latch (no photos). Three screws secure the lock actuator to the door latch. In addition, there is a small control lever that must be removed from the latch. 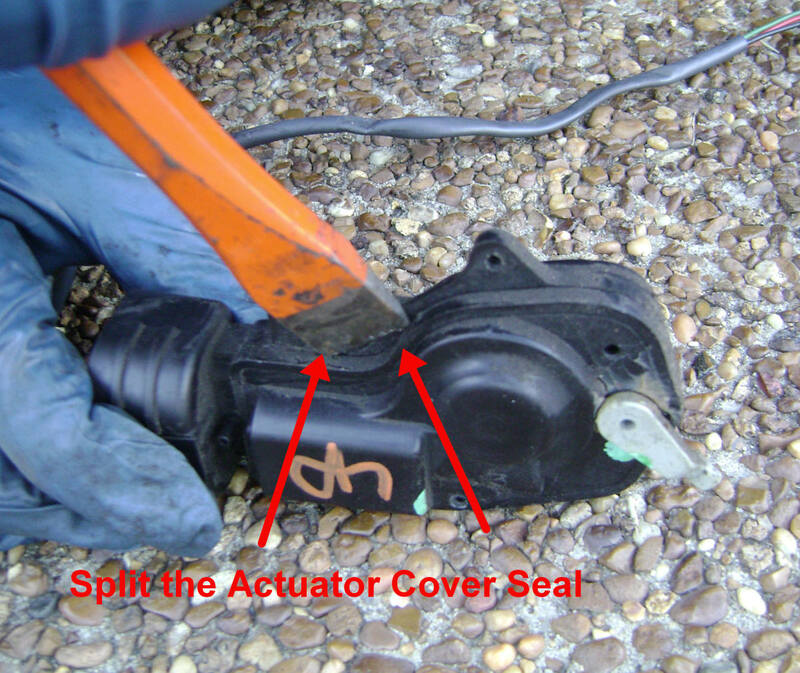 First, remove the door lock actuator assembly from the dock latch. There are three screws and a control lever that must be removed (no photo). The actuator assembly covers are glued together. Use either a small chisel or a wide flat-head screwdriver with a hammer to separate the covers. Remove the exposed motor from the assembly. Slip the worm gear off of the motor shaft. Slip the worm gear onto the new motor. Re-install the new motor and glue together the assembly covers with any plastic glue. Good work Bryan! This isn't that easy a job. Thanks. This was very helpful. It was extremely difficult to get the latch assembly out and back in past the window rail. But this info and a used part allowed me to fix the door for $50.